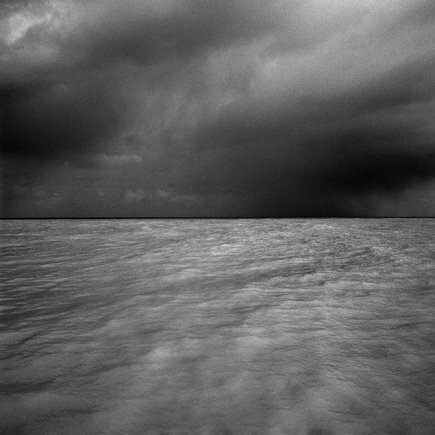 People always tell me that interesting photographs are made when there’s interesting weather. I’m not sure that rain falls into the ‘interesting’ category but we’ve certainly had a lot of the stuff in the last couple of weeks regardless of which coast you’re on. Going to a location to photograph and getting rain the whole time you’re there leaves you with some choices but essentially, wait for the rain to stop or get out in the stuff and make the most of it. I’ve definitely been one to wait for the rain to stop, particularly when it’s cold. Who needs to be wet and cold? 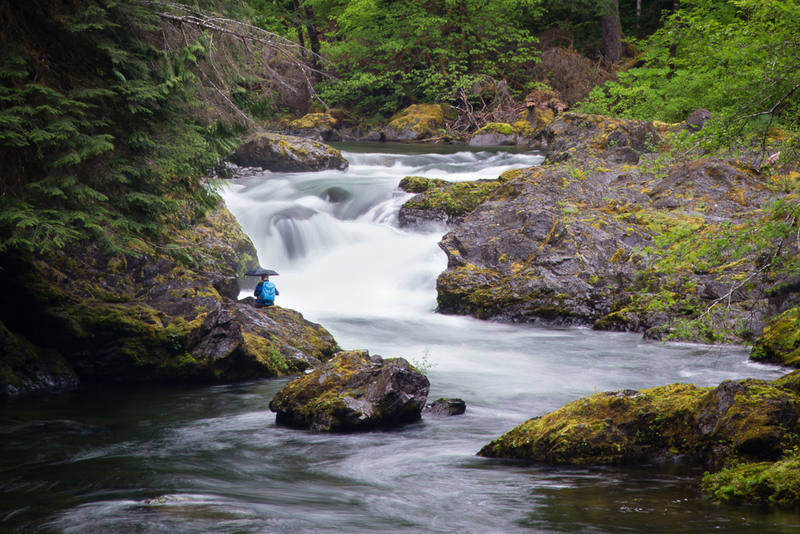 For shooting in forests in the spring, overcast weather, perhaps a little drizzly, is ideal. 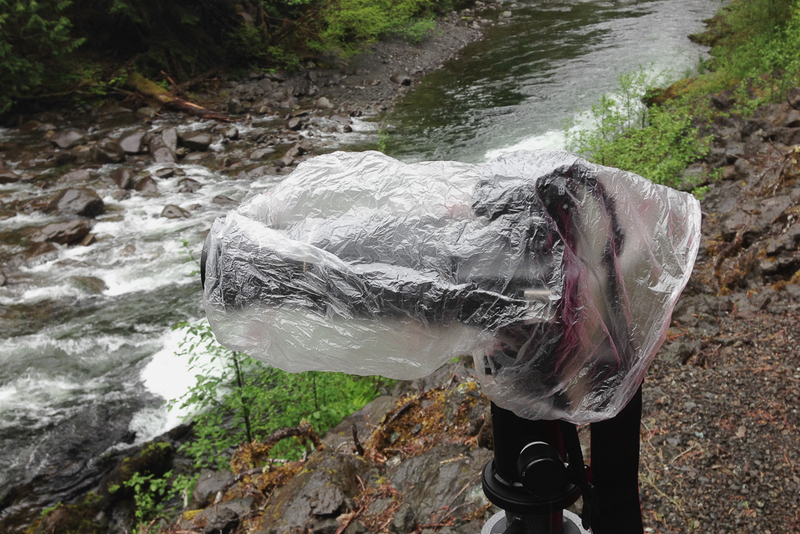 But that also means you have to deal with how to prevent your gear from getting too wet. Part of my reluctance to photographing in the rain is that, since electronics and water do not mix, it just doesn’t make sense. Now I know that many DSLR cameras have some degree of ‘weather-proofing’, and generally the higher up in the range the better the weather proofing but nothing is ideal. Art Wolfe tells an amusing story of how he encouraged a group of his workshop students using Canon 5Dmkii cameras to keep shooting even though it was raining and all their cameras stopped working while his 1D kept going. So you’re committed to shooting in all weathers what to do? You could of course use an umbrella like the photographer in the image above. The classic approach that many workshop instructors will advise is to use a hand towel placed on top of your gear. It absorbs the rain and you can wipe your stuff down too. It seems to work quite well and hand towels are readily available, especially if you’re staying in a hotel! You could perhaps compliment this with one of the disposable shower caps that you can often find in hotel rooms which would cover up the back of the camera. An alternate to this approach is the use of rain covers. There are an number of such proprietary covers that fit every budget. I have an aquatech basic cover, shown below. 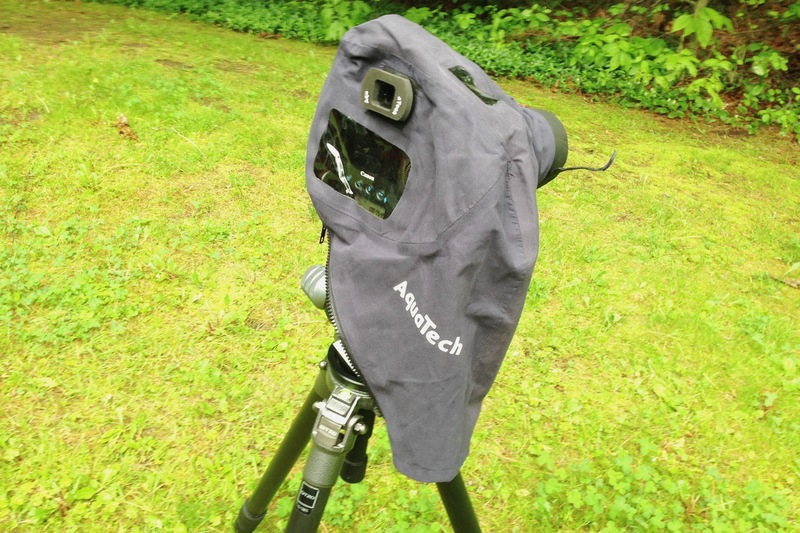 The one odd thing about this rain cover is that it also requires a special eyepiece that’s specific for your camera. The eyepiece is neat, large and spongy, perfect for someone like me who wears glasses and so I keep it on the camera full time. It’s a bit of a wrestle to get the cover on but it works great. My friend Jen showed me how to improvise a serviceable rain cover from a couple of items you can find in the produce isle of the local grocery store. Check it out in the image below. To make this you need one of the plastic bags that grocery stores provide for loose vegetables and a sturdy rubber band. I’m told that the rubber bands that hold bundles of asparagus together are ideal, although I like the ones that hold Andy Boy brand broccoli together. Then all you need to do is put the bag over the camera with the open end towards the camera body. Use the rubber band to hold the bag in place around the lens and then once the bag is firmly in place tear out the bottom so that the lens has an unobstructed view. I know many people would advise against it but I have skylight filters on all of my lenses and so ‘tearing the bottom out of the bag’ is really a matter of running my finger nail around the groove between the filter and the lens which is generally enough to neatly tear the bag. For those old enough to remember CDs, I used to do something similar to open the CD package – run my finger along the groove that the hinge of the case between the top and bottom parts. I must admit that this improvised cover works just as well as my aquatech cover. Something to consider if your caught out. 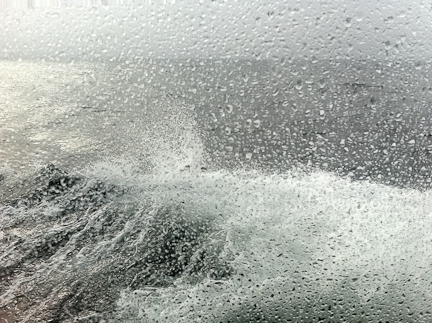 As a photographer and a sailor the weather has a major impact on my activities. As a photographer I look for weather that suits the style of photographs that I’m currently working towards and plan appropriately. As a sailor I’m watching the weather and modifying the sails to match changes in wind and changing plans to account for storms. We need to be equally skilled at looking for and responding to the winds of change in our careers and personal lives. We must change and continue to innovate if the hope is to build and sustain our business and career. Being creative, looking beyond the obvious, offering something more than just what the camera is able to bring seems to be the way to succeed. Opportunities abound for those willing to try small experiments, review the feedback from those experiments and try again until something is found that works. 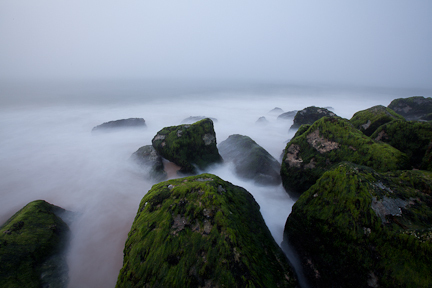 It always surprises me that summer days along the coast can start off very foggy. 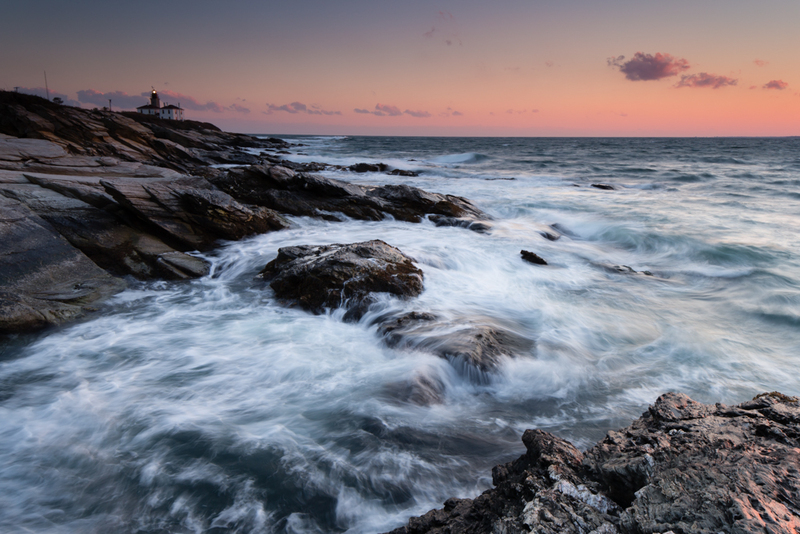 This is typical of summers in Maine but also happens often in long island sound. Perhaps you already understand the phenomenon, I didn’t but after getting up at 3 am on a couple of mornings to find myself socked in with fog I thought that I ought to understand how to predict whether the morning will be foggy or not. This link seems to provide the answer. Of course we can’t control the weather and with limited time sometimes you just have to roll with what nature serves up. This is exactly what I did on this morning. I was at a new beach and although I had a general sense of where I was going wasn’t 100% sure. I could hear the ocean but couldn’t see it. I headed along the beach until I found the rocks that I’d seen using google maps. Once on location I played around for a while and made the image below.